Coarsely powder the almond & cashew nut. Cut china grass into small pieces & keep aside. Heat the milk in a nonstick pan. Add sugar, stir till it dissolves. Add almond-cashew nut powder & china grass. Keep stirring till china grass dissolves completely. 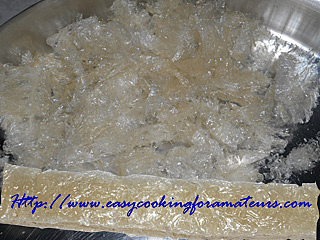 Boil it for few minutes until it gets little bit thick consistency. Pour it to a plate or tray. When it sets a bit garnish it with almond pieces. Refrigerate it for 20-30min or till it sets completely. 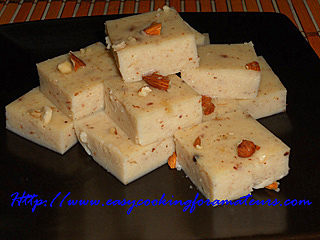 Remove from refrigerator & cut into square or diamond pieces. Note: Mould can be used to get different shapes. Invert the mould to get pudding in the mould shape. China Grass Pudding ready to serve chilled. Store the remaining pieces in refrigerator. Note: You can garnish it with any dry fruits or cherry. Yumm,feel like gobbing some,marvellous pudding..
lovely china grass recipe!...looks yum! They look sooooo neat n delicious! Looks perfect & neatly done!!! Makes a delightful dessert!! 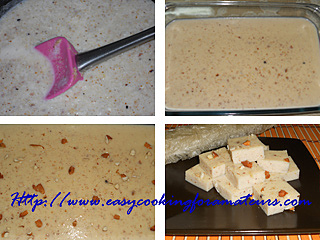 This is an easy to make and yummy pudding.. Always a hit here.. Sounds yummm, have agar agar in the pantry...but absolutely left with no clue to whip anything! thanks for sharing the recipe, will give it a try. can i grab some?? loved them..
perfect setting of milk pudding. Those puddings look so lovely! I would love to take a few of them! tasty n delicious..love your interesting recipes dear..
ummmm....delicious pudding!!! nice & easy recipes...following you!! I've never used china grass or had anything with this but this looks simply great and delicious..feel like grabbing one from the screen and indulge myself...great recipe! Yummy pudding. First time here, u have a nice space. Glad to follow u! wow lovely perfect looking pudding there! Lovely recipe.. looks absolutely tempting and delicious.. thanks for visiting my blog.. keep in touch dear !! Just bumped into ur blog. Hats off to you for maintaining such a good blog. Please visit mine if time permits. Looks delicious!!! I will surely try this.